In 2067, eight years after the events depicted in “Macross Frontier”, a remote part of the Milky Way Galaxy called the Brisingr Globular Clustrer is being plagued by a strange disease called the Var Syndrome. This mysterious phenomenon turns people berserk without any apparent cause. Stationed on the planet Ragna, an idol team named Walküre uses the power of their music to calm down those infected by the Var Syndrome. Assisting them is an ace Valkyrie pilot team called Delta Flight. On the nearby planet of Al Shahal, itinerant worker Hayate Immelman discovers a stowaway girl named Freyja Wion inside a crate of apples being imported from the planet Windermere. Freyja is a Windemerean who believes she has arrived on the planet Ranga in order to take part in an audition to become a member of Walküre. However Hayate informs her is has ended up in Al Shahal. With port security after her, Hayate helps Freyja escape. A sudden outbreak of Var Syndrome causes several Zentradi soldiers to attack the city. Walküre arrive along with Delta Flight to calm the situation, however they are attacked by a group of mysterious fighters who turn out to be the Aerial Knights from Windermere. Freyja decides to join in with Walküre and sing in an effort to supress the Var Syndrome, while Hayate commandeers an abandoned Valkyrie in order to protect Freyja. Later Hayate is reprimanded for his actions but is ultimately set free. Having lost his job, he decides to accompany Freyja to Ranga so she can audition. However when she arrives she is told that she is ineligible to take part as this is the final stage of the auditions for the group. But due to her actions on Al Shahal, she is given special permission to take part. Despite putting on a good performances, none of the participants in the audition are selected to join Walküre. Later as a despondent Freyja leaves on the train, a fellow passenger develops Var Syndrome and she sings in order to calm him. However this was all an elaborate ruse put on by members of Walküre and Delta Flight as a final test for Freyja. She has passed with flying colours and is invited to be a permanent member of the group. Meanwhile the commander of the Delta Flight, Arad Mölders, attempts to recruit Hayate as a pilot due to the skills he has shown in the battle on Al Shahal. Though sceptical at first and unwilling to take orders, he accepts the offer because he wants to fly again. Hayate is taken on as a cadet under the guidance of flight leader Mirage Farina Jenius, niece of Mylene Flare Jenius (from “Macross 7”). Completely unimpressed with his attitude, Mirage works Hayate hard and complains when he slacks off. Freyja is also learning the ropes while training with the other Walküre members. Mikumo Guynemer, lead vocalist for the group often points out the mistakes that Freyia makes, which naturally upsets her. At an upcoming concert Mikumo reminds Freyia not to make any mistakes or she will be kicked out of the group. In the middle of the concert, Aerial Knights attack and a mass Vars outbreak also occurs simultaneously. Mikumo and Freyja sing in unison to stop the outbreak. The other members of Walküre note how their voices combined in order to suppress the Var outbreak quickly. The Aerial Knights attack has been a distraction in order for Windemerean Kingdom in order to occupy the planet Voldor. They also announce declaration of war to the New Unified Government. Later Walküre and Delta Flight go on a covert mission to planet Voldor to discover the Windemerean Kingdom’s plans. They explore ancient ruins left by the Protoculture Civilization which seems to be projecting the song that Windemerean Kingdom’s young crown prince, Heinz Nehrich Windermere, sings, which seems to be the key factor in all of the recent Var Syndrome outbreaks. The team discover that Windemereans are controlling the population through Var Syndrome, which leaves people in an obedient zombie like state, and plan to take over all of the planets in the same manner. “Macross Delta” is the fourth TV series in the “Macross” franchise. Though this series has (some) links to 2008’s “Macross Frontier”, you really don't need to have seen that series in order to understand “Macross Delta”. Which is good, because I have not seen “Macross Frontier” (or “Macross Zero” for that matter). However I am a big fan of the other parts of the series. “Macross 7” is in particular a guilty pleasure for me. As per usual for Macross anime, Shoji Kawamori is the series director as well as being responsible for the series concept and story. Kenji Yasuda is the co-director of the series. He previously directed “Croisée in a Foreign Labyrinth”. Other staff include Hidetaka Tenjin who is best known for his Macross plastic model box art work, and Thomas Romain, the French designer and creator of “Basquash!” who provides a lot of the design work. The series was created and animated by the studio Satelight who also produced “Macross Frontier” as well as the visually similar “Basquash!”, “AKB0048”, “Bodacious Space Pirates” and “Symphogear”. There are several elements I really enjoyed in this show. Like all of the previous Macross shows, this TV series also has a large focus on the music. It’s played up more here than in previous series with a focus on an idol group. This shouldn’t be surprising as anime (and otaku) has gone gaga for idols over the last decade or so. It’s a trend that finally seems to be petering out (thank god…). However most of the music in this show is pretty good and a cut above most modern “anisongs”. For the last day or so I have had the first opening theme song, “Ichido dake no Koi nara” stuck in my head. It's pretty catchy. Naturally the five main voice actors who make up Walküre also perform as the real life Walküre, appearing in concerts as well as releasing CDs and other merchandise. The other part I really enjoyed was the designs and world(s) created by the staff. The planet Ragna is strange mishmash of Polynesian culture infused with Chinese and Japanese food, architecture and customs. The indigenous population appear Polynesian but are amphibious with the main local wildlife being mercats (i.e half cat, half mermaid). The mecha designs are also top notch with some very exciting dog fight scenes. Unfortunately I failed to engage with “Macross Delta” a fair whack of the time. The big problem was that both the leads, Freyja and Hayate, aren’t all that interesting. To a large degree they’re archetypes; just a composite of every other character you’ve seen. As per all Macross series, the obligatory love triangle, with Mirage providing the third side, isn’t all that interesting. In fact it’s pretty flat and tired. Mirage pretty much doesn’t make any attempt to woo Hayate and just seems to sigh and look on sadly as Freyja steals his heart. Surprisingly a lot of the CG in the first episode is pretty shocking to be honest. However by the second episode it improves dramatically. Once the focus starts to shift to the Windemerean Kingdom, and the internal politics in the royal family and Aerial Knights the show improves significantly. There’s also a larger focus on the mysterious lead singer of Mikumo, who is a far more interesting character than the cutesy “moe every girl” that is Freyja. I bought all nine volumes of this show when I was in Japan in March. Most from second hand shops in a one day shopping spree in Nipponbashi in Osaka. Eight of the nine volumes I bought second hand from the two a-Too shops (the Kanto area version of Surugaya) in the area for almost half price and pretty much in mint condition. Unusually all nine volumes are English subtitled (especially unusual since the show is not streaming anywhere in English). Apparently the key driver behind this was two Macross fans living in Japan, Gwyn Campbell and Adrian Lozano, who seem to have convinced Bandai Visual to add the subtitles to the series. Volumes 1, 4 and 7 come with really nice artboxes which house the other volumes. Hidetaka Tenjin provides the gorgeous artwork for the individual volumes; usually one of the pilots in Delta Flight in their Valkyrie. Each volume comes with a 44 page booklet with designs, artwork and interviews and the disc is housed in a digipak case with character artwork. The packaging is really well done and thoughtful. It knocks any western release out of the park. 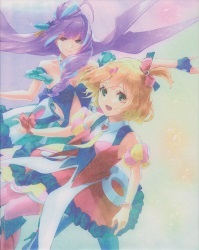 On disc extras include “making of” featurettes, TV commercials for “Macross Delta” products, a Walküre concert, interviews and clean opening and closings. There are also bonus animated parody shorts, however none of these are subtitled. Also included is the preview version of episode 1 which was originally broadcast in December 2015, four months before the official broadcast. Overall I found “Macross Delta” to one of the more mediocre parts of the Macross franchise. The two leads aren’t all that interesting and even though by the seventh episode with a heavier focus on Windemerean Kingdom, it still failed to draw me into the story at times. However when it worked, it really worked well. I just wish all the elements in the show could have been at the same consistent levels. The writing should have been a bit better as well. You could also view this show as a cynical marketing ploy to sell albums for an idol group; however the music is really well integrated into the story. But it's hard to get past the fact it’s quite an uneven show. I really had high expectations as it was part of the Macross franchise and was ultimately let down. I can only give “Macross Delta” 6.5 out of 10. Remaining Backlog: 19 TV series, 7 OVAs and 14 movies. In addition I am also waiting for additional parts of four TV series to be released before viewing them.